We bought our Charleston, SC, house in March 2010 for $360,000. It was one of the smallest houses in a sought-after neighborhood and needed a good deal of work. We put $60,000 and a lot of sweat equity into it and four years later sold it without a realtor in a bidding war for more than asking price. The sale price was $515,000, so after we paid the sellers’ agent, we netted a $85,000 profit. During the four years of renovating, I kept a close watch on our per-square-foot investment. We purchased the house at $150 a square foot, and the average house sale in the neighborhood garnered $177 a square foot. I was confident that we could command more than the average, because smaller houses typically can. I definitely overspent in some areas. For example, I purchased gorgeous, high-end hardware for the interior doors – dumb decision. Very few people pay attention to the door hardware, and most people are perfectly satisfied with a mid-range brand. I got lucky with a set of beautiful glass doors for my front entrance. 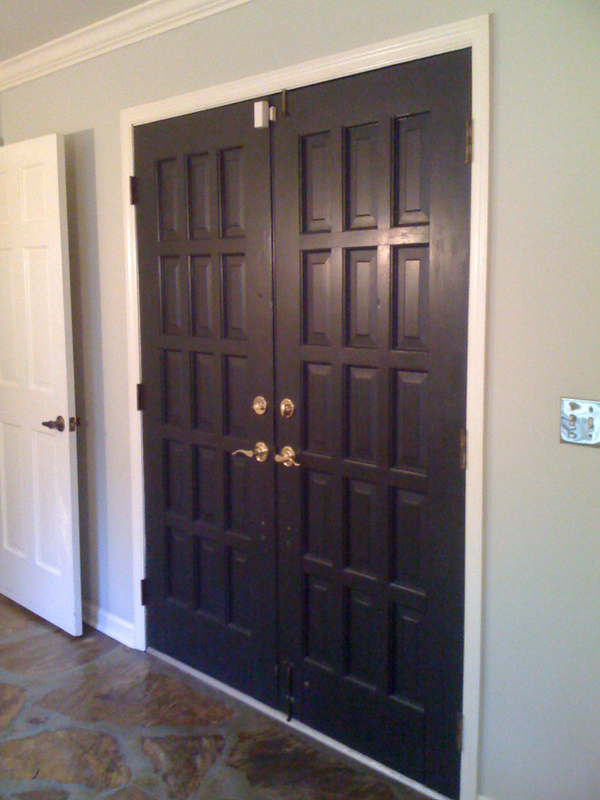 They were sitting unused in the basement of my in-laws’ house and were the EXACT measurements of my front double doors! A coat closet was turned into a powder room,perfectly situated so that guests didn’t have to use the shared full-bath in the bedroom hallway. This was $8,000 well spent. 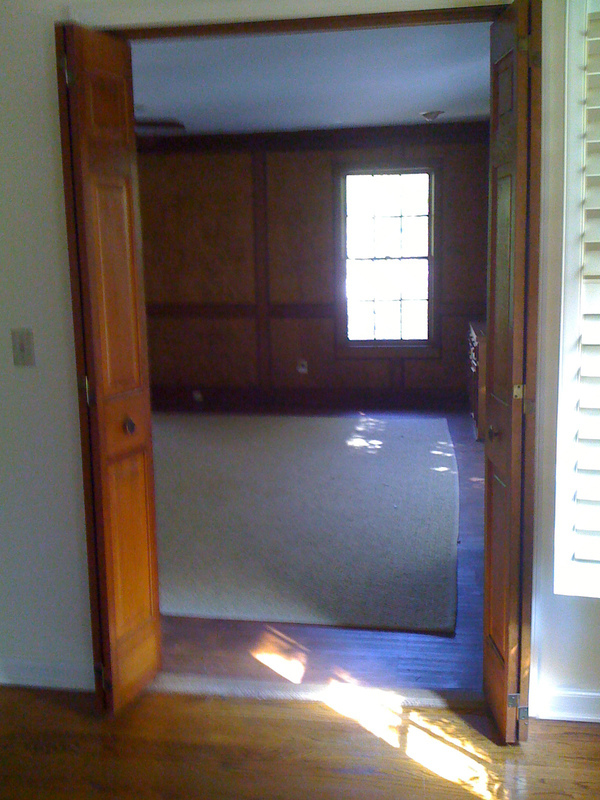 Hardwoods replaced carpet in the bedrooms, and the entire house was sanded and restrained a dark ebony. The kitchen got a facelift – canned lighting, new cabinet doors, granite countertops and a subway tile backsplash. The new doors made a huge difference, even though the original 1973 cabinets remained. A dingy acoustic tile ceiling in the office/playroom was covered with breadboard and crown moulding – brilliant! We installed high-end draperies (which we took with us when we sold) and drapery hardware in the living room and dining room, giving those rooms an elegant feel and hiding the old single-paned windows that we didn’t replace. We sold the house at $215 a square foot – the highest ever in the neighborhood. 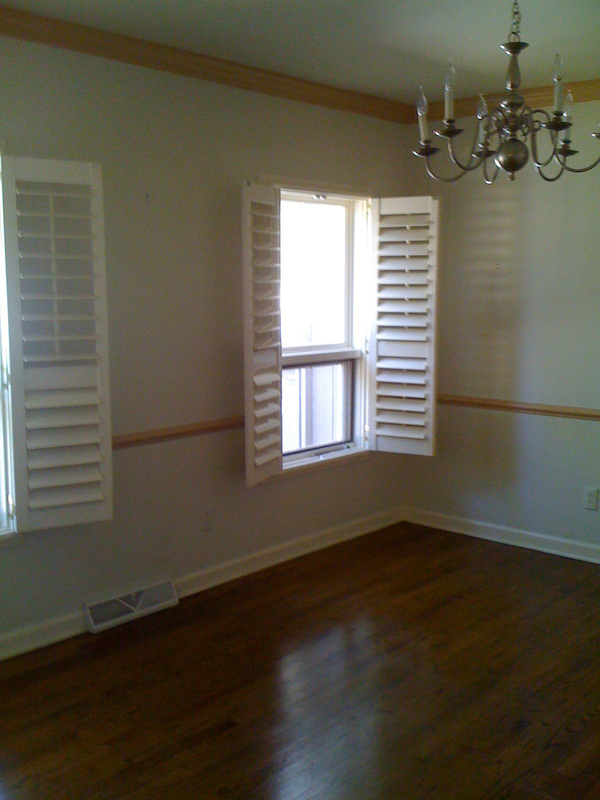 You can see all the “after” photos on Pinterest, which we used to market the house. And here are some before shots. 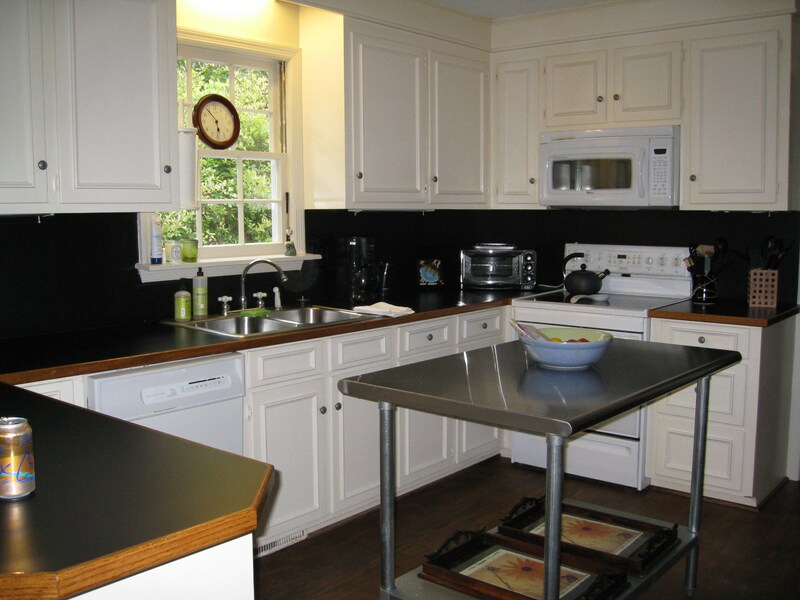 We replaced the kitchen cabinet doors and installed granite countertops and a subway tile backsplash. 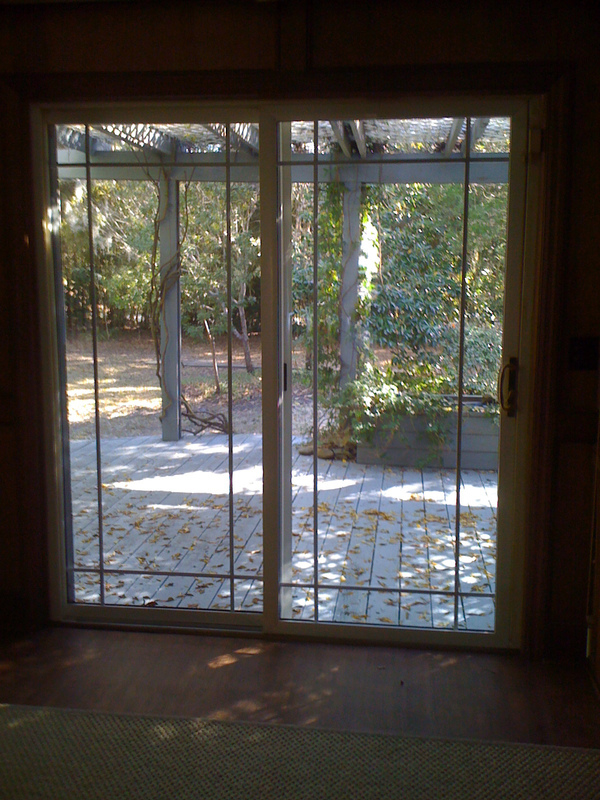 The sliding glass doors in the family room were replaced with glass french doors. The front doors really dated the house. We replaced them with glass. In the family room, we papered the top panels with a shimmery sea grass wallpaper and painted the bottom panels and all trim at matching olive color. Who wants to paint dental moulding? Not me! 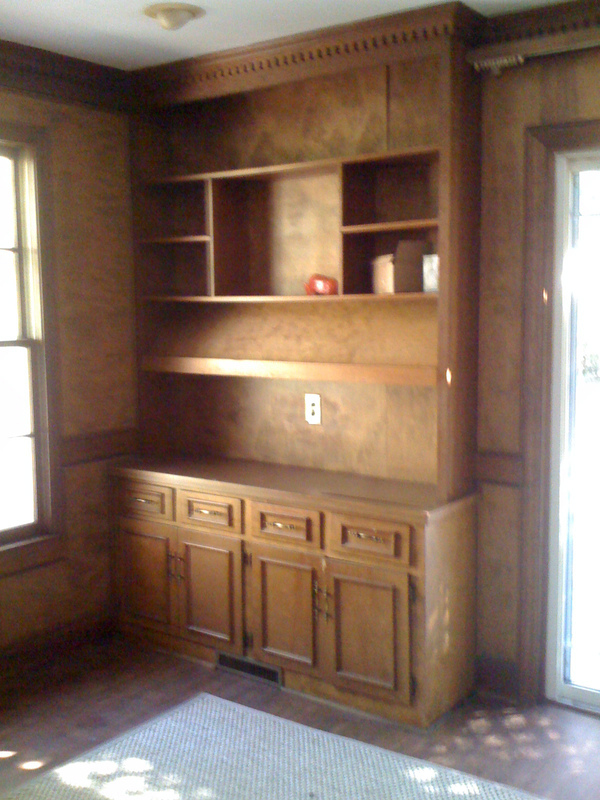 It was replaced with crown, and the cabinetry was ripped out to make room for a custom-built bar. Our dining room had a chopped-up look and was dark.